Getting an authentic barbecue flavor when cooking ribs on a gas grill can be difficult. Gas grills are great for hot and fast cooking, but not so efficient when you need to turn a rack of ribs into tender, smoky barbecue. There are some tricks you can use to bbq ribs. To get the best possible ribs from your gas grill, all you need is this process. This example uses a full rack of trimmed spare ribs. You can use baby back ribs with this same method, but reduce the cooking time about 5 minutes per stage. As is, the total cooking time will be between 1 1/2 and 2 hours. Not using a gas grill? Try barbecue ribs on a charcoal grill for even better results. It is rare to find store-bought spareribs that are properly prepared. You will need to do some basic trimming before cooking. Ideally, what you're looking for is a rack of ribs with a square shape and an even thickness throughout. Make sure you inspect the ribs for any loose pieces of meat, fat, or bone. Cut off any excess scraps or excessive fat from the rack. This doesn't mean cutting all the fat off, just reduce the thicker parts. Since we are grilling these ribs faster than we would on the smoker, the benefit of the fat isn't as great. You need fat to keep the meat moist, but you don't want to end up with an overly fatty finished product. Once done trimming, rinse the rack of ribs with cold water and pat dry with paper towels. Once the ribs are trimmed and rinsed, it is time to apply the rub. A good rib rub adds flavor but doesn't overpower the meat. You want to apply the rub evenly over the meat. This means back and front as well as the sides and ends. Apply as much rub as will stick, letting the excess fall away. The natural moisture of the ribs will hold all the rub you need. You can apply the rub up to an hour before you start cooking, but any longer will affect the texture of the meat, giving it a ham-like flavor and texture. If you need to return the rack to the refrigerator after putting on the rub, wrap it tightly with plastic wrap and handle it gently. Preferably, try to get the ribs to the grill within 10 to 20 minutes of applying the rub. Making a proper smoke on a gas grill while cooking at lower temperatures is a real challenge. While you might be able to give these ribs a hint of smoke, they are not going to have a strong smoke flavor. That is the sacrifice of using a gas grill. You can try by throwing in a couple of smoke bombs to generate smoke. This is a quick, easy, and cheap way to make smoke on a gas grill. To make a smoke bomb start by placing about 1/2 cup of damp, but not wet, wood chips on a piece of foil. Wrap the wood chips so that one side has a single layer of foil. Poke several holes through the foil to let the smoke out. Place the smoke bombs under the cooking grate as close as possible to the burner you are using. You will need to preheat the grill hot enough to get the combustion of the wood started. Once you see smoke coming out of the smoke bombs, turn down the heat, place the ribs on the grill, and close the lid. The grill placement is most important. You need indirect heat to cook ribs without drying them out or overcooking them. The goal is to hit temperatures up to 375 degrees Fahrenheit /190 degrees Celsius. If you have a grill with the burners running front to back, you will need to use one of the burners on either end. Let's say you are using the left side burner. This means you place your smoke bombs directly over this burner (and under the cooking grate). The ribs will be placed to the right of the hot burner. If the rack of ribs is short enough to be placed running parallel to the burners, set it near the hot burner but not over it. Otherwise, you might have to place it in a more diagonal position on the grill which will require rotating the rack of ribs occasionally to even the cooking. Place the rack, bone-side down on the grill, close the lid, and adjust the grill until it holds a temperature of 300 degrees Fahrenheit/150 degrees Celsius. Now, let the ribs cook for 30 minutes. Don't open the lid. This will hold in as much smoke as possible. Don't expect a lot of smoke to billow out of the grill as there won't be a tremendous amount of smoke production. Once the ribs have been on the grill for 30 minutes, it is time to move on to the second stage. The ribs should be browned on all sides. If they appear raw on the surface anywhere continued grilling for another 10 to 15 minutes, otherwise, move on to the second phase. This step makes the ribs tender by steaming them with apple juice. The secret is to wrap the ribs tightly in foil. You want to make it as watertight as possible after pouring in the apple juice. With a tightly wrapped packet, place the ribs back on the grill in the indirect grilling space. Now close the lid and increase the grill temperature to around 375 degrees Fahrenheit. At this temperature, the apple juice will boil, tenderizing the ribs, and cooking them quickly. Once the ribs are ready to continue, set your grill temperature around 250 degrees Fahrenheit F/120 degrees Celsius, but definitely not more than 265 degrees Fahrenheit /130 degrees Celsius (the burning temperature of sugar). Place the ribs back in the same place to finish cooking. When smoking ribs, it is up to you whether to add sauce or not. With the gas grill method, it's ideal to use a good barbecue sauce. It adds authentic barbecue flavor to your ribs and adds to the surface texture of the meat. 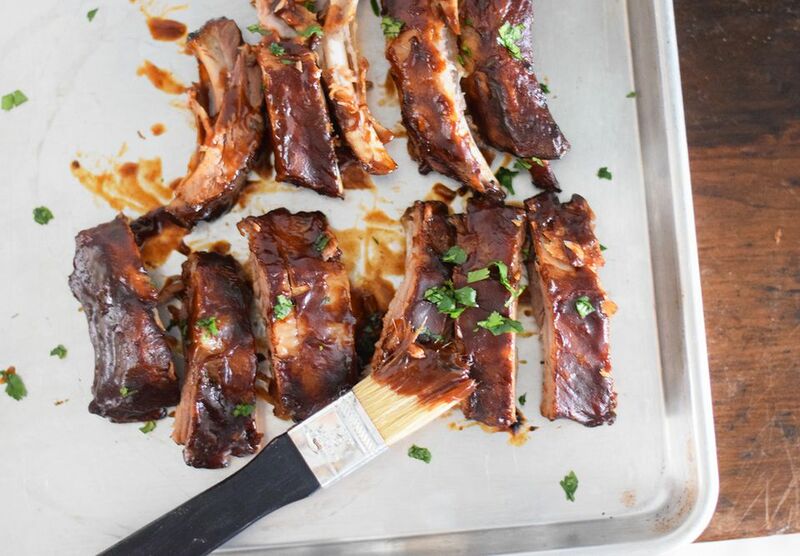 The secret to a good sticky rib is multiple coats of barbecue sauce. The best method is to sauce one side of the ribs, close the lid and cook for 5 minutes. Then open the lid, flip the ribs and sauce the other side. Do this for 30 minutes and you will have a heavy coating of barbecue sauce. Five minutes after you put on the last coat (with at least 2 coats per side) take your ribs off, cut, and serve. 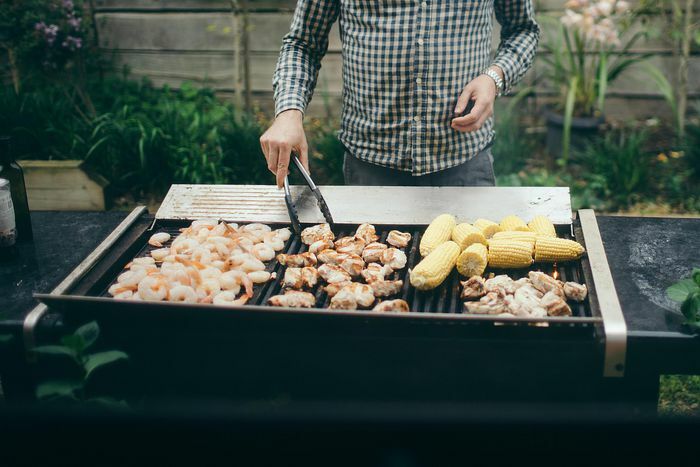 How Do You Give Your Food a Smoky Flavor on a Gas Grill?